RRB Bangalore had released 1172 vacancies for RRB ALP and 2293 vacancies for Group D. The RRB Bangalore has successfully conducted the RRB ALP Exam from 9th August to 31st August 2018. For the RRB Group D, the board has begun to conduct the exam from 17th September 2018 onwards that will last till 14th December. A large number of applicants have applied for RRB Bangalore ALP and Group D.
RRB Bangalore JE Recruitment – Railway Recruitment Board of Bangalore is soon going to announce the release of RRB Bangalore JE Recruitment 2019. The eligible and interested candidates can check the official notification that is expected to be released by 29th December 2018. RRB JE Notification will soon be updated here for the candidates to check and download. 02/01/2019 Latest Update: RRB Bangalore JE Application Form is released. Click on the link and Fill your Application form before 31/01/2019. RRB Bangalore JE Online Form 2019 is expected to release on the official website of RRB Bangalore by January 2019. The candidates are informed in advance about the upcoming recruitment. Through the interim resources, we have found that RRB is very soon going to announce a 14,000 approximate vacancies for JE posts. The candidate will have to fill the form online only. We will soon update the link of RRB JE Application Form 2019 here. 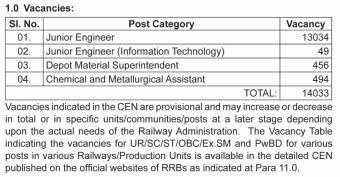 26/12/2018 Latest Update (RRB Bangalore JE Recruitment): RRB has released the official notification for RRB Junior Engineer 14,033 posts. The candidates can read the notice in PDF below. The Junior Engineer Recruitment from RRB Bangalore has been released for 14,033 posts. The candidates are advised to check the dates for the RRB Bangalore JE Application Form 2019. The Applications will be carried out in the month of January 2019. All the candidates are required to check if they clear the eligibility criteria before filling the application form. Following dates are announced. Railway Recruitment Board will soon announce the RRB Bangalore JE Vacancy 2019 for the candidates. In the official notice for the recruitment drive, candidates can check the RRB JE Vacancy, RRB CDMS Vacancy, and RRB CMA Vacancy. it is advisable to wait for the official notification for the release of the confirmed RRB Junior Engineer Vacancy 2019. Railway Recruitment Board of Bangalore has released the confirmed dates that RRB Bangalore Jr. Engineer Online Forms. The candidates should read the official notification and confirm their eligibility criteria. Following steps can be taken to fill the application forms. Search for the link of notification of RRB Jr. Engineer. Select the link and register yourself for the recruitment. The candidate will then be turned to candidate’s login. The candidate will submit the Registration Number and password that was communicated to them through Email address. Fill in the details that are required in the RRB Bangalore JE Application Form 2019. Submit the Application form and application fee. Print the application confirmation page. Recently, Railway Recruitment Board Bangalore has released the RRB ALP Answer key on the official website where candidates can verify their answers and evaluate their performance. Not only this, the RRB Bangalore has activated the mock test link where candidates can practice free mock test. RRB Bangalore has released the RRB Bangalore Group D Admit card for those candidates whose exam is scheduled on 24th September 2018. Candidates can easily download their RRB Bangalore Group D Admit card by visiting the official website. There are some students who face a lot of troubles while downloading the admit card. To help them, below we are providing some steps that candidates can follow to avoid any problem while downloading the admit card. Click on the RRB Bangalore region. RRB Group D Admit card will be displayed on the screen. Candidates are advised that while downloading their RRB Group D Admit card, they must ensure that all the details printed on the admit card is true and correct. This is beacuse these details will be verified during the documentation Round. If the details do not match with that of RRB Group D admit card, his selection in RRB Bangalore for the post of Group D can be canceled. The candidates must carry the RRB Group D admit card when they go to appear for the RRB Group D CBT Exam. In the absence of admit card, the candidates will not be allowed to sit in the examination. The registration number is required for every work may it be downloading the admit card or to check your result. Practicing mock test also needs your registration number and candidates cannot download their SC/ ST Free travel authority pass without the registration number. The registration number is also required to download the RRB ALP Answer key. Without the registration number, a candidate can not download the answer key. So, candidates must remember their registration number and password. If a candidate has lost his registration number, he can get it back through the registered e-mail id. RRB Bangalore has also released RRB Exam Center link where candidates can check their exam city, date of exam, shift and timings for exams. To access the RRB Group D exam city link the candidates need to login into the RRB Portal using the registration number and password. The link is acivated only for those candidates whose exam is scheduled between 17th September 2018 to 16th October 2018. For the candidates whose exams are after 16th October 2018, the Board will release a link again where candidates can check their exam status that includes exam city, date of exam, shift and timings for exams. While conducting RRB ALP Exams, the RRB Bangalore had done the same. The board had released a link where candidates could check exam city, date of exam, shift and timings for the exam using their registration number and password. RRB Bangalore had released the RRB Bangalore ALP Answer key on 13th September 2018 where candidates could easily check the answer and verify them from the answers that they have given in the exam. The answer key is accessible til 19th September 2018. The RRB Bangalore has provided additional facility and it has released a link where candidates can raise objections against answers given in the answer key. The link will become live on 21st September 2018. For the Group D, the RRB Bangalore will release the Group d answer key after the successful completion of exam. The RRB Bangalore will conduct the RRB Group D Exam from 17th September 2018 that will continue till 14th December 2018. After the exams are over, the RRB Bangalore will publish the answer key on the official website. RRB Bangalore Result will release for both ALP & Group D. For the time being, RRB Bangalore has issued answer key for ALP. After some time, the RRB Bangalore will publish the alp result on the official website. Candidates can easily check the ALP Result once it is officially declared by RRB Bangalore. For the Group D, the RRB Bangalore will first release the answer key. Answer key will be published by RRB Bangalore after the completion of Group D. The RRB Bangalore has scheduled the exam from 17th September 2018 to 14th December 2018. After the RRB Bangalore releases, Group D Answer key, within one month or two month, the RRB Bangalore will release the RRB Group D Result on the official website. RRB Bangalore will release RRB ALP Cut Off and RRB Group D Cut off. The cutoff is the minimum marks required by candidates to advance to the next round of recruitment process. RRB Bangalore will announce the cutoff for ALP & Group D on the official website of RRB Bangalore. In case, if the candidates do not bring the cutoff marks, he will be eliminated from the recruitment process. RRB Bangalore releases different cutoff for different categories. The cutoff also depends on some factors that takes the cutoff to a higher level or lower level. These factors include number of vacancy, number of applicant and difficulty level of exam. RRB Bangalore selects the candidates on the basis of the marks obtained by candidates in the exam. On the basis of the marks, the RRB Bangalore prepares the cutoff marks. Qualifying the cutoff marks is required to reach the next stage of Physical Efficiency Test. In the physical efficiency round, the efficiency of candidates is checked. There is a different criteria prescribed by RRB Bangalore for Physical Efficiency Round. The selection process is same for both ALP & Group D.
To bring the recruitment agencies from far-flung areas nearer to the candidates.